This practical plan features stylish arches on the front porch and cedar shake shingles on the gables for tremendous curb appeal. The foyer features a generous coat closet and access to the great room with cathedral ceiling, fireplace, built-in shelves, and French doors to the rear deck. Columns divide the great room from dining room, which is augmented by a lovely tray ceiling. The kitchen boasts a practical design and a sizable pantry nearby. A cathedral ceiling enhances the master suite, which enjoys a walk-in closet and private bath with linen closet and enclosed toilet. 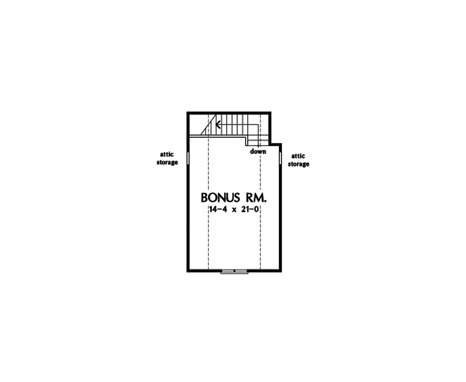 Finish the bonus room for extra living space or use it for storage. 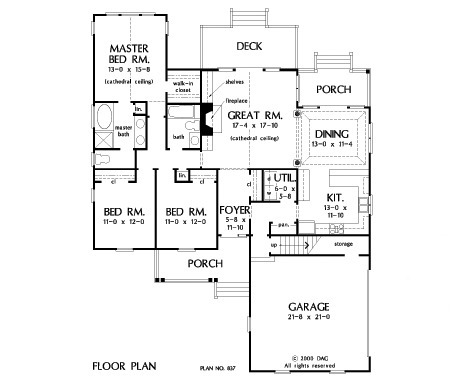 House Dimensions: 51' 0" x 65' 10"
Great Room: 17' 4" x 17' 10"
Foyer : 5' 8" x 11' 10" x 9' 0"
Great Room (Cathedral): 17' 4" x 17' 10" x 17' 11"
Kitchen : 13' 0" x 11' 10" x 9' 0"
Bonus Room (Vaulted): 14' 4" x 21' 0" x 8' 0"
Garage Storage : 13' 0" x 3' 4" x 0' 0"
Master Bedroom (Cathedral): 13' 0" x 15' 8" x 16' 2"
Porch - Front : 17' 4" x 6' 0" x 0' 0"
Porch - Rear : 13' 4" x 7' 0" x 0' 0"
Deck / Patio : 18' 0" x 8' 0" x 0' 0"